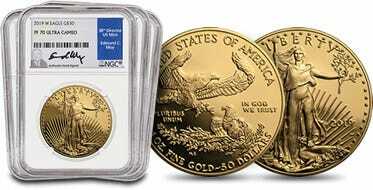 The Gold Bullion Act of 1985 authorized the United States Mint to begin producing the Gold American Eagle coin. 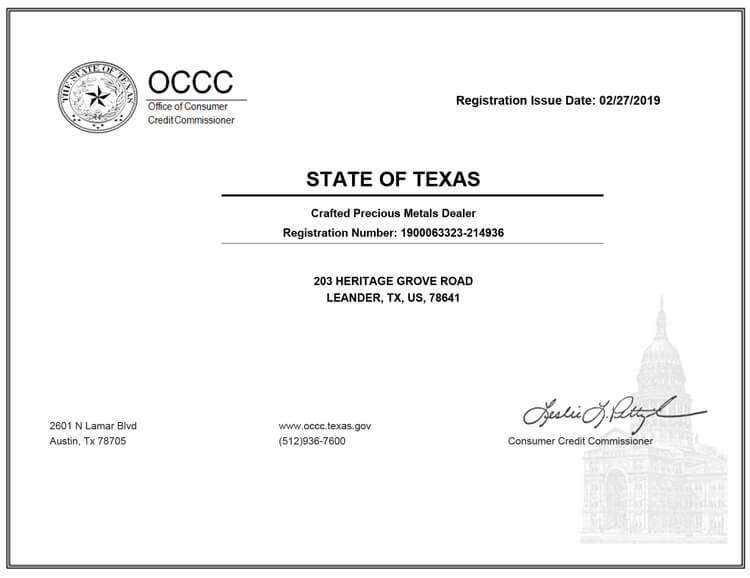 Part of the act dictated that the gold used in the production of the coins must come from the United States and the coins must be alloyed with silver and copper. The alloying of the coins is to create a more sturdy, wear-resistant coin than a 24 karat gold coin. 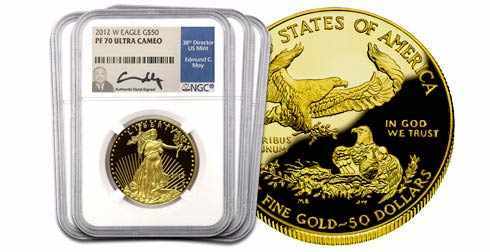 The 22 karat Gold American Eagle quickly gained in popularity and has become a favorite among investors. Lady Liberty graces the obverse of the coin. Borrowing largely from the iconic Saint-Gaudens design, Lady Liberty is walking forward with her right foot in front of her left. Her long flowing hair is to her right side. In her right hand she is holding a torch and in her left hand is an olive branch. These are symbols of the light and peace associated with liberty. President Theodore Roosevelt commissioned Saint-Gaudens to beautify American coinage and make it more like that of the ancient Greeks and Romans. The result was a Lady Liberty design that is widely regarded as the most beautiful ever created in the history of the United States. A male bald eagle with wings spread in preparation for landing in the nest he shares with a female eagle and their young eaglet. UNITED STATES OF AMERICA is directly above the male bald eagle and IN GOD WE TRUST is on the right side of the coin, above the nest. The reverse design is the work of sculptor Miley Busiek. Reverse is a beautiful design incorporating the symbol of American freedom, the bald eagle. The alloying of the gold with silver and copper make the Gold American Eagle sturdier than other gold coins in the market. 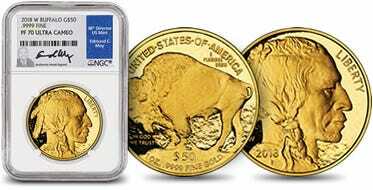 The ½ oz size allows investors to add gold more economically to their portfolios. Typically the $25 dollar Gold American Eagle is minted in lower populations and thus typically more difficult to obtain than the other sizes of Gold American Eagles. The relative scarcity of these coins make them a great investment.